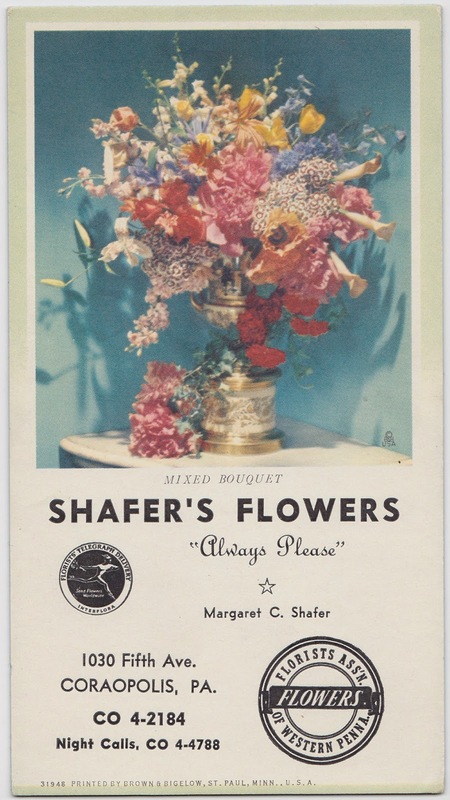 Margaret C. Shafer had you covered 24/7 in Coraopolis, Pennsylvania, in the mid-20th century. This old ink blotter highlights the "Night Calls" number at Shafer's Flowers, among other things. In case you had an emergency need for flowers at 2 a.m., of course. And the blotter itself was printed by Brown & Bigelow, a company from St. Paul, Minnesota, was that was founded in 1896 and is still around, churning out quality promotional products for customers. Clearly, I should ask them to produce some Papergreat ink blotters. If they still even make ink blotters.